Our welcoming and luxurious 4 Star Pitlochry hotel offers contemporary country house style in a quiet elevated position in central Pitlochry. 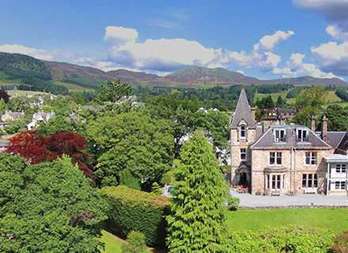 Most of our 14 bedrooms benefit from stunning panoramic views of Pitlochry and the surrounding hills of Highland Perthshire. Roaring log fires help to make our luxury guest lounge a wonderfully relaxing space to enjoy drinks and canapés before taking dinner in our two AA rosette restaurant. 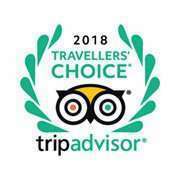 At Knockendarroch we pride ourselves on excellent food, comfortable rooms, wonderful views and friendly service. ...we have a few rooms available with prices from £130 per night B&B. You can also upgrade to include dinner for only £25 per person, which is an amazing half price deal. Pitlochry hotels have been popular with tourists for over 150 years. The stunning mountain and mixed woodland scenery with its many lochs, rivers and waterfalls is well mapped for walkers and mountain-bikers. Pitlochry Golf Club, home of the Highland Open, is just 5 minutes up the road, also offering great views over the town and down the Vale of Atholl. A more sedate way to enjoy the great Scottish Highland scenery of Perthshire is from the many well-planned viewpoints and easy access paths throughout the area. With multiple other attractions, including the ever popular Pitlochry Festival Theatre, the dam and salmon ladder, castles and historic attractions, groves of ‘Big Trees’, distilleries, shops and great cafes and delis, Pitlochry has a lot to offer. However you decide to make use of your visit to Pitlochry, the comfort of our luxury highland hotel with its stunning Highland Perthshire views, excellent food and friendly service make Knockendarroch a perfect place to stay. Note: Pitlochry train station is a main line station with direct trains to Edinburgh, Glasgow and London. We have private parking for all guests including two with electric vehicle / Tesla chargers. Complimentary WiFi is available throughout our Pitlochry accommodation. For theatre goers we offer pre-theatre dining and a complimentary transport service during the main season.